With miles of bushwacking and tedious rock hopping, the North Bass Trail is not for the faint of heart. From Swamp Point, drop 800 feet via switchbacks to the Muav Saddle junction. Though steep, the trail is decent for the first mile or so – enjoy it while it lasts. A couple trails branch off in different directions at the saddle. Stay left on the North Bass Trail, skirting along the base of the Coconino Sandstone (a trail leading to an old Forest Service cabin veers to the right, and a third trail climbs up to the top of Powell Plateau). After passing Queen Anne Spring, the trail plunges downward again. Switchbacks quicken the descent, and you fight through thick vegetation where the trail crosses a drainage. The trail deteriorates as you follow the route down a steep ridge, and by the time you reach the main drainage of White Creek, it’s a full on bushwack. 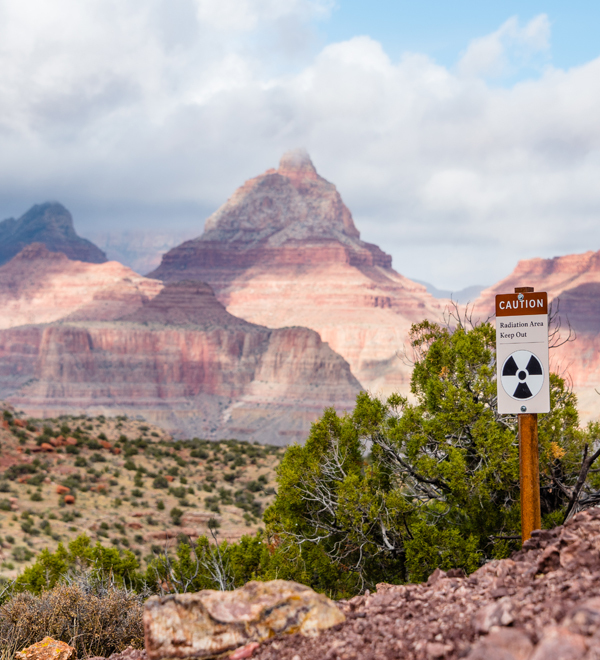 You’ll be tunneling through willows, agaves, manzanita, and scrub oak for the next several miles as you descend through the Supai Formation. Wearing long pants and a long sleeve shirt are highly recommended. Keep an eye out for cairns, as the route occasionally leaves the streambed to bypass small pouroffs. 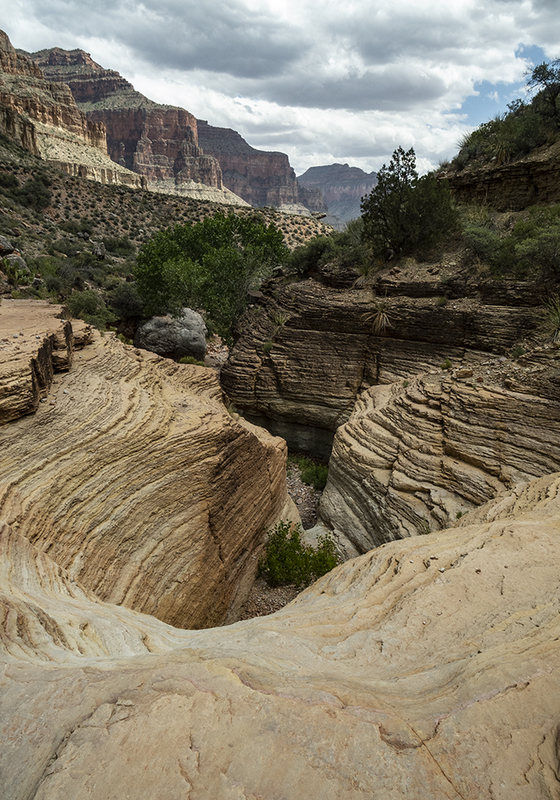 Around 2.9 miles, the trail leaves the canyon floor and contours along the top of the Redwall Limestone. 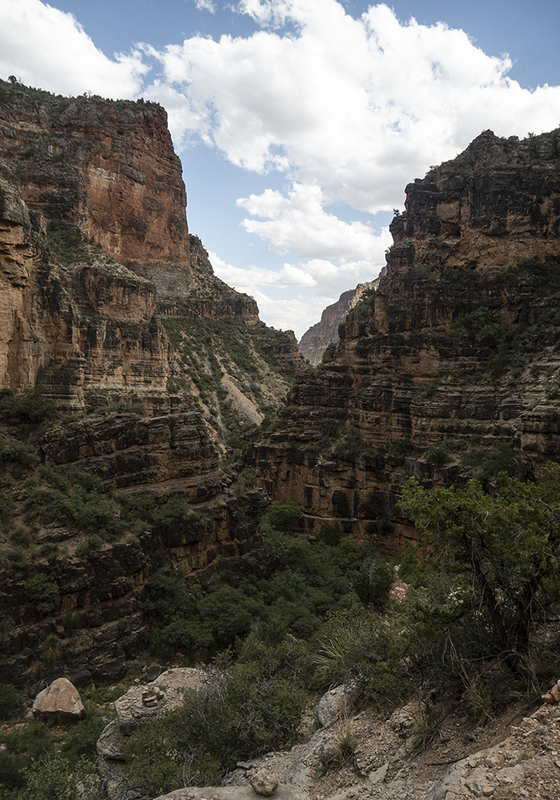 You pass a couple campsites suitable for single tents along the rim, with beautiful views toward the South Rim. The route down the Redwall Limestone is precarious to say the least. Hike (or more likely slip, slide, and skid) your way down the 650-foot drop. Take your time and be careful. When you finally reach the canyon floor, you are in the heart of the Redwall gorge, where the scenery is spectacular and walking tiresome. You’ll likely find flowing water in the bottom of White Creek after the descent. Make your way downcanyon, crisscrossing the creek and picking your way through a jungle of brush. Some slickrock benches make excellent snack spots. Eventually, a cairned route on the right (west) leaves the canyon floor, bypasses a small falls, and drops you back into White Creek a half mile downstream (the creekbed is dry from here until you reach Shinumu Creek). When the trail exits White Creek around 7 miles, rejoice, for the rockhopping is (mostly) over! You contour along the Tonto Platform for about 2 miles, cutting down a set of switchbacks to Shinumu Creek. The confluence of White Creek and Shinumu Creek is a short ways upstream of where the trail drops you. If you’re looking for a great campsite, head toward the confluence of the two creeks. 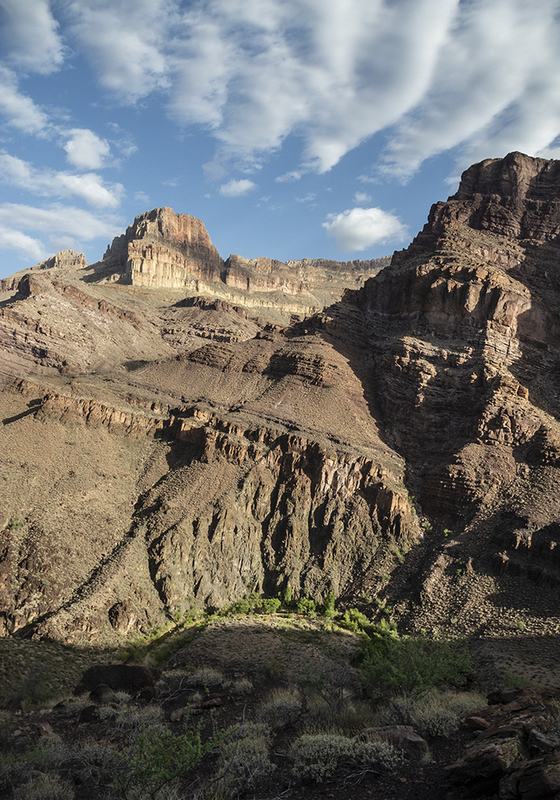 William Wallace Bass, an early Grand Canyon explorer, was one of the first to realize the canyon’s tourism potential. 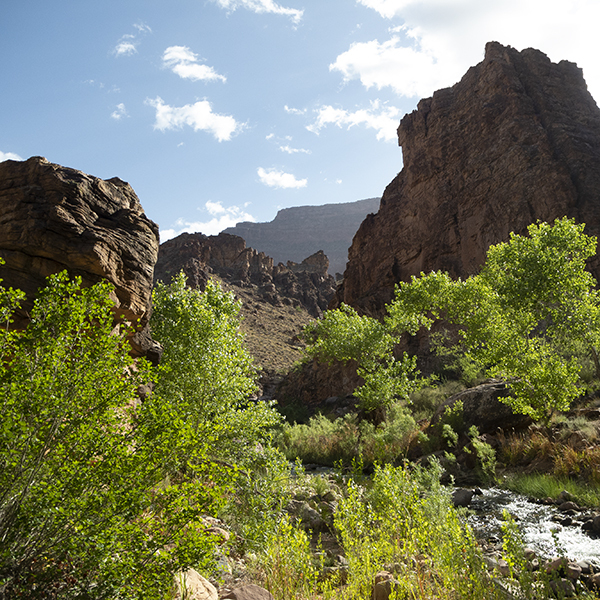 He developed the area that’s about 30 miles west of today’s Grand Canyon village, and built the first trans-canyon trail system, connecting the South Bass and North Bass trails by a cable crossing at the Colorado River. On the north side of the river, Bass built a camp and planted an orchard. 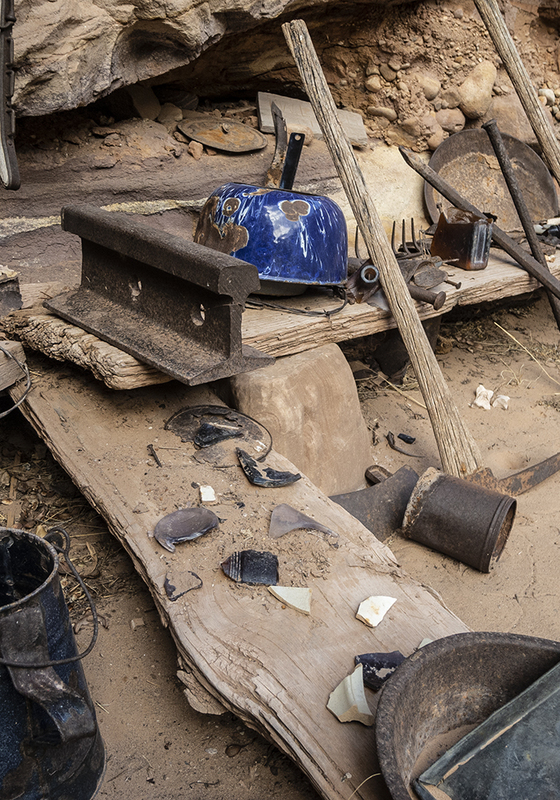 Today, you can see a collection of historic artifacts, from mining tools to cooking kettles. About a quarter mile downstream of Bass Camp, the trail leaves Shinumu Creek and climbs 450 feet to a saddle. Cross the ridge, and descend 700 feet down the other side to the Colorado River. You can camp at the first big beach, or hike along the top of the cliffs upstream, past Bass rapid, to the beach at the mouth of Hotauta Canyon. During spring, summer, and fall, expect to share these beaches with river trips. Day 3: Hike to the top of the Redwall Limestone (this would be a dry camp. Either stash water on the way down or bring enough with you). Day 4: Hike back up to the trailhead.